In July 2015 Sony launched a special edition Xperia Z3 phone and a matching Sandqvist backpack designed by Sabinna. The research behind the project were artists from the Netherlands, that lived in the beginning of the 20th century and created beautiful furniture, paintings and other art pieces full of geometric shapes. Their artist’s association was called “De Stijl”. 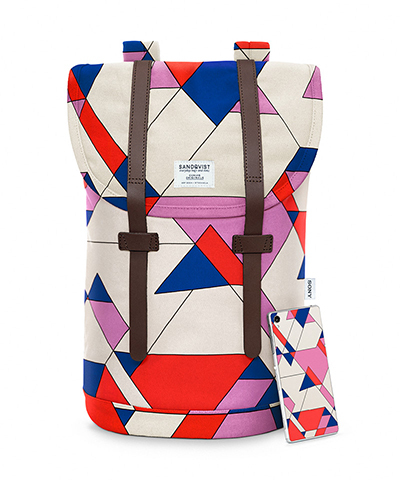 Their geometric shapes inspired the look and the colours of the final print for the backpack and the phone. Both, phone and backpack are waterproof, making them perfect for every day adventures. Both products are a limited edition.